NoCry Cut Resistant Gloves with Grip Dots - High Performance Level 5 Protection, Food Grade. Size Large, Free Ebook Included! 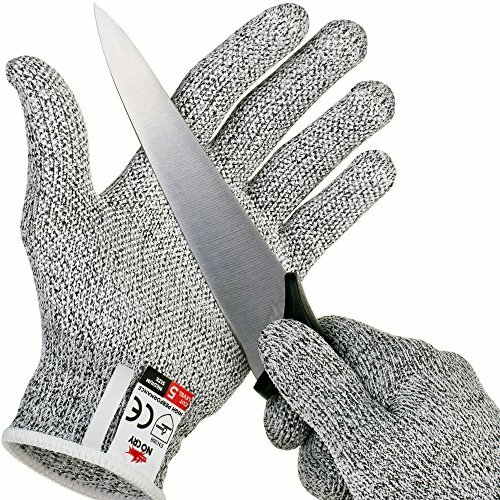 No matter what sharp objects you're handling - from kitchen knives and vegetable peelers to graters and wood carving blades or even broken glass,NoCry cut resistant gloves protect your hands from cuts, scrapes, nicks, slices, and serious accidents. ***Certified EN388 Level 5 cut protection rating***. The fingers and palms of these gloves are overlaid with our slip-resistant Microdot technology - tiny silicone dots that firmly grasp and hold things more securely. Because these Microdots are so small, they flex and bend naturally. This amazing technology doesn't interfere with dexterity or precision the way regular rubber coating does. No more slipping. No more accidents. Machine crafted from a protective, light-weight blend of High-Performance Polyethylene, fiberglass, and Spandex, these gloves fit snuggly on your hand and fingers. No floppy or bulky fingertips. These flexible gloves won't buckle, pucker, bulge or get in your way like leather, Kevlar or wire-mesh. Light and thin so you can feel the items you are cutting, NoCry gloves weigh less than an ounce and feel surprisingly soft given how much protection they provide. Available in three sizes-small, medium and large-to ensure they fit snuggly when you wear them. NoCry gloves are machine washable. After using the gloves, just throw them in a dishwasher or washing machine and hang them to drip dry. All of our gloves are backed up by our no-hassle NoCry guarantee. Should there be an issue with your gloves we'll replace them for free or give you your money back. Click the orange "Add to Cart" button to get your NoCry gloves today! View More In Cut Resistant Gloves. If you have any questions about this product by NoCry, contact us by completing and submitting the form below. If you are looking for a specif part number, please include it with your message.